What I saw today at Apple’s annual WWDC event in the new iOS 7 was a radical departure from the previous design of the company’s operating system — what CEO Tim Cook called “a stunning new user interface.” But whether this new design is actually good design, well, that’s a different story entirely. Apple did indeed tout a completely rethought mobile OS, one which isn’t technically a great distance from its predecessor but is an incredible deviation on design. Gone are lush, skeuomorphic objects, dials, and textures (in fact, Apple took several potshots at itself about the faux-felt and wood textures of the iOS of yesteryear). Instead, they have been replaced with stark, largely white and open app spaces; colorful, almost childlike icons; pencil thin, abstract controls for settings. New, Gaussian blur-transparency layers slide over your content, creating thick smears of soft color; notifications and other incidental information float above your work area on semi-translucent panels. The icons are striking to see, and they’re the first sign that there are points of confusion and even missteps in Apple’s new approach. For starters, the icon styles vary wildly from app to app. Game Center is now a collection of 3D globs, rendered together against a white background, while the Camera icon recalls something more like clip-art — an icon set against a rudimentary gray gradient that seems to want to be more abstract than it is. It looks shockingly basic, and more childish than elegant. The same goes for Weather, an amateur mishmash of sun, clouds, and a gradient background that was highlighted as part of Apple’s new “grid system.” It might be on a grid, but it doesn’t look very good. The Maps icon is a mess: too many colors and lines intersecting at once. Messages’ word balloon is so puffed up and oversized compared to its fine point that it looks like it will topple over. Another journalist remarked to me that the Settings icon looked more like an oven burner than a set of gears. I agreed, and still do now as I sit looking at it. It looks like clip-art of an oven burner, and again, that lazy gradient isn’t doing the icon any favors. Weirdly, though there wasn’t any mention of active icons in iOS 7, the calendar displays the correct date (as it always has), and the clock icon is updated with the current time in all the screenshots we’ve seen. Weather, however, frustratingly remains unchanged. Don’t even get me started on weather. Okay, fine: again Apple seems to ignore the utility of glanceable information, keeping safely to an annoying dance of swipes and secret menus to get to basic information… like the current temperature. But with the icons, there’s an enormous feeling that Apple’s designers couldn’t decide on a direction. And for all the jokes about skeumorphism, I would have preferred something nearer to the company’s previous efforts than the new set, which seems closer to bathroom signage than even the Windows Phone’s plainness. It’s not just that the icons on the homescreen feel and look like the work of a lesser designer. They also vary across the system. For instance, the camera icon is a different shape in other sections of the OS, like the camera app or the lockscreen. Shouldn’t there be some consistency? Elsewhere there is trouble — instead of correcting issues with the notification panel and alerts, Apple has simply given them a fresh coat of paint and several layers of sub-navigation. Your notifications will still interrupt your work at the top of the screen, and when you slide down the panel you’re now presented with the option of flipping between the kinds of notifications you want to see. Even closing notifications looks harder, the small “X” box now nearly invisible against that soft blur background. But fundamentally these are unimproved from Apple’s last attempt, offering no action to take (which the company did actually just add to the forthcoming version of OS X), and doing nothing to actually speed up your productivity on the device. The Control Center, a new option which can be summoned with a quick swipe up from the bottom of the screen, is actually a great idea but its design and organization of items is bizarre. It is an odd, jarring collection of functions. Toggles for oft-used controls, a brightness bar, a music player? AirDrop accessibility? A flashlight app? The clock? It feels like for lack of a better location Apple lumped all the other stuff into a single, messy space that floats above your onscreen content, making the already busy utility a visual strain. The idea is good, the execution is troubling. Inside apps, iconography has been transported from the familiar to the confusing. 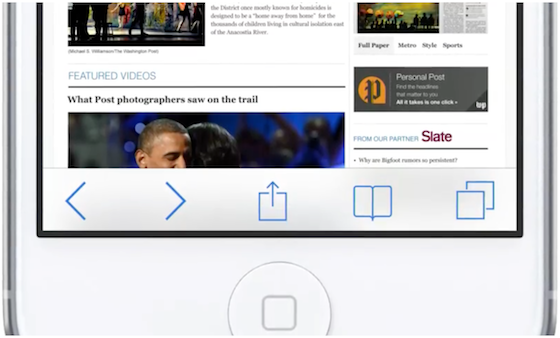 Take a look at those new controls in Safari. What’s that box with the arrow on top of it? It appears to be your sharing options, but it doesn’t look like any sharing icon you know. It’s almost as if in an attempt to move away from familiar shapes and textures, Apple has confused its design with new shapes and textures — weird ones. Less useful ones. But it’s not all a loss, or a miss. In fact, there are some extremely beautiful aspects of iOS 7 — aspects that lead me to believe that the raw materials for a more cohesive and useful OS are there, if perhaps a little buried. Apple is showing that it can adapt, borrow, and tweak ideas from the competition, that it can expand what iOS feels and looks like as well as what it can do. The problem now is that it seems to be buckling a bit under the weight of an end-to-end redesign. I’m hopeful that in the next few months, as Apple ramps up for the introduction of new hardware at its fall event, some of the design and functionality issues that have yet to be addressed will be nipped and tucked. And perhaps the designers and engineers in Cupertino will revisit simply bad design decisions, like those obstructing notifications or the cluttered Control Center.